Strategic planner to compare the passenger experience and service quality impacts of broad policy options such as introduction of higher capacity rolling stock to the network. 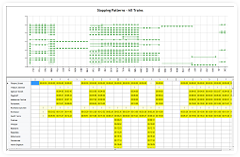 Timetabler to quickly assess the passenger loading and rollingstock impacts of various timetable options, such as introducing short starters on some lines. Regulator to confidently and easily determine the 'winners and losers' before a new timetable is implemented, thereby ensuring passenger and government policy needs are met. Network-wide route-finding capabilities, so an Origin Destination matrix can be used instead of customised approximations. An accurate train loading algorithm. A sophisticated overcrowding algorithm which takes into account passenger behaviour towards overcrowding services. Integration with outer tools such as RailSys, RailTable, and Microsoft Office. A clean, well designed user interface. Together, these features provide integrated, out of the box timetable evaluation capacity which is unmatched by any other tool on the market. Train Load Predictor™ gives you the answers and the insight to improve your railway quickly, giving a rapid return on investment and letting you identify and focus on the critical issues, before the timetable goes live. Train Load Predictor™ provides quick and easy access to all key customer experience and service quality indicators. Comparisons can be made between different timetable options of the key factors which influence the customer experience. This analysis can focus on the particular issues relevant to your railway, and be done at the level of detail appropriate for your needs. Problem: Uneven service loadings, leading to delays and passenger dissatisfaction on some services, combined with underutilisation of rollingstock on other services. Use TLP to: identify these issues in advance before a timetable is implemented so that the timetable can be adjusted to balance the loadings. Problem: Long standing times for passengers on certain lines, above a preferred standing time threshold. Use TLP to: balance the loadings, adjust stopping patterns, add more services. Problem: Uneven service intervals, leading to overcrowding/undercrowding, long platform waiting time and lengthened door to door travel time. Use TLP to: adjust the timetable to balance the service intervals. Problem: High average passenger minutes of travel. Use TLP to: trade off travel time costs and benefits, shortening travel time where this has the most benefits, and optionally lengthening travel times slightly where this causes the least disbenefit. Problem: High interchange time between services, which discourage passenger interchanging. Use TLP to: adjust the timetable around key interchange stations to minimise interchange times for the majority of interchanging passengers. Lunarr is highly experienced at carrying out this type of analysis for new timetables. We can perform this analysis as a service, providing a detailed report and recommendation. See services and support for more information. 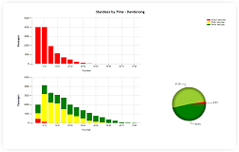 Train Load Predictor™ provides an overview of rollingstock utilisation across the day. This information, combined with the accurate prediction of passenger loadings, allows you to create timetables where each service is well utilised by passengers. This means the timetable will use less trains, less track and be cheaper to operate. 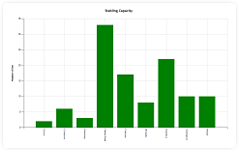 Under and overutilised services can be easily identified using the top maximum loadings and bottom average loadings charts. Station utilisation may be investigated using the top and bottom station movements, boardings and service level charts, passengers movement charts and the hours of operation view. This information can help railway operators plan for efficient railway operations, anticipating the need for upgrades and identifying areas where money can be saved by trimming costs. Train Load Predictor™ forecasts the number of passengers interchanging between platforms and waiting on platforms. This type of data identifies key crowding points on the network and within stations, which provides a key input for more detailed pedestrian modelling and station design tools. Allocate passengers onto individual services. Allocate passenger automatically between origin destination pair, using advance routefinding algorithm to determine the most likely routes of travel. Impact of passenger overcrowding on train attractiveness is incorporated into choice of service if 'Consider service crowding levels' option is selected. Provides high level summary overview of the timetable, including KPIs, loadings and travel time. Integrated charts of key outputs: loadings, passenger movement, sets in operation, etc. Charts of highest & lowest loadings, boarding, movements, service levels, etc.